Nowadays, San Giustino is a town of modern aspect whose main industries apart from agriculture,are the metal-working and nutritional industries. 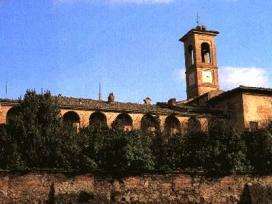 Bufalini Castle, which was erected in 1422, testifies to the ancient history of this town, which was first feud of the Dotti, then of the Bufalini family. This building, which was transformed into a magnificent villa by the Vasari, contains, in the interior, decorations in the grotesque style which have been attributed to Cristoforo Gherardiand, and outside, gardens and a labyrinth. Here it is also possible to admire very fascinating paintings such as the "Madonna with Child and Saints" by Signorelli, a "Madonna" by Andrea del Sarto and other works of art by Guido Reni.